The machines of the World Time Attack Challenge really do represent a hearty slice of motorsport nerd nirvana. Regardless of the common goal of negotiating the 12 turns of Sydney Motorsport Park’s (SMSP) ‘GP’ circuit in minimal time, the modus operandi among the spectrum of highly-tuned race hardware used to achieve this objective means that for the speed-purist, the spectacle is nothing short of mouth watering. With control tyres being one of the few truly limiting factors for each of the competition classes, heavy attention is paid to elaborate aero packages in order to gain valuable grip. 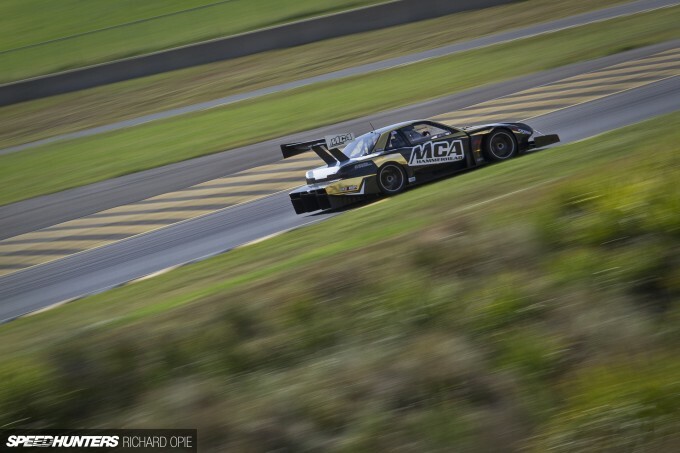 This aero has become synonymous with WTAC, not to mention well documented. In this story however, we’ll be taking a look at a range of the powerplants that grace the WTAC hopefuls, proving that much like choice of platform, there’s more than one way to slay the circuit’s curves. 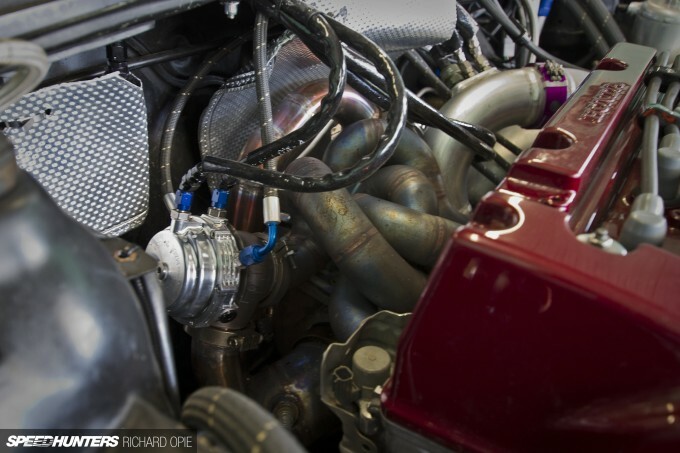 Starting with a hiss and a roar, I don’t think this story could be complete without some detail on the powerplant of one the most anticipated new builds of WTAC 2015. Sporting some of the wildest (yet somehow restrained in appearance) aero yet, it’s easy to forget the PR Technology Porsche 968 was also packing one of pit lanes most innovative means of generating horsepower. Beneath the carbon front clip, PR Technology chose to heavily rework the 968’s standard issue M44 16V 4-cylinder. Although displacing 3.0 litres stock, the big four-pot has been punched out to 3.1 litres using the stock crank and a set of larger bore pistons machined from blanks. The big BorgWarner EFR9180 turbo reaches full boost (21psi) at just 3000rpm, on its way to an estimated 700hp at the 7000rpm redline and maxing out a set of 1500cc primary injectors controlled by MoTeC’s latest M150 engine management system. The most notable change, however, is the flipped head, placing the inlet plenum and fuel on the driver’s side of the engine bay, while the exhaust manifold now hangs opposite. Without going too in depth, the primary advantage here is packaging; the creation of a distinct hot and cold side of the engine bay and creation of simplified and superior flowing pipework. With no testing, the 968 shows extreme promise, and with some development under their belt the team will be one to keep an eye on in 2016. Like the PR Technology build, MCA’s ‘Hammerhead V2′ was touted as another of the ‘next generation’ time attack challengers. Draped over a chassis built to the Pro class rules, the svelte carbon fibre shell concealed a thorough translation of the ultimate circuit-spec SR20. Chatting to Josh Coote from MCA, the big surprise between the strut towers of the Silvia is the use of a stock SR20VE head casting. With flow characteristics beyond the standard SR20DET, MCA’s take on the Nissan head uses 1.0mm oversize valves and a custom set of cams running the standard VE cam profile, but the deletion of the variable valve lift arrangement in an effort to minimise moving parts. A Mazworx manifold supports a Garrett GTX3582 turbo forcing a maximum of 32psi boost back around to the Hypertune inlet manifold fronted by a standard Nissan VH45 throttle body. While the head is relatively mild, the MCA team has built a rock solid bottom end around a completely custom billet block. Inside, a JUN 92mm stroker crank teamed with 90mm forged CP pistons increases displacement to around 2.4 litres, good enough for an approximate 700hp at the rear Advans. Now, I chose this particular car simply because I loved it. A long-time fan of the M-Speed R34 GT-R, Matt Longhurst took cues from this fabled Skyline time assassin and created his own vision of the perfect RB-powered track weapon. 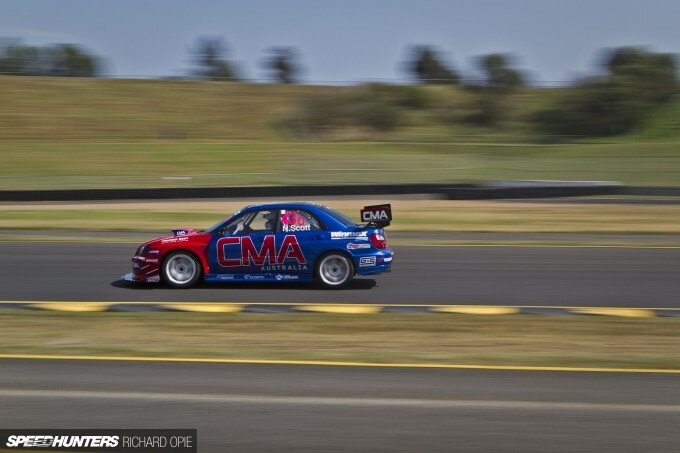 It’s worth mentioning that the team trailered the Skyline from Adelaide to attend WTAC – a mere 14-hour journey. No WTAC would be complete without the guttural roar of a highly-strung RB26, and this Open class GT-R displayed one of the tidiest bays of the field. 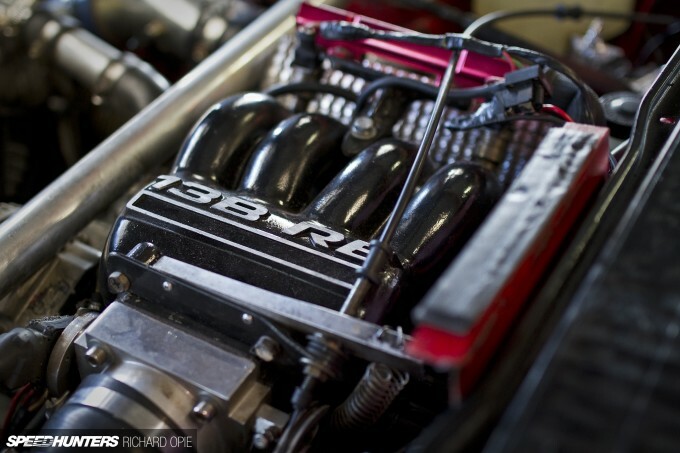 The basis of Matt’s Skyline is a Tomei ‘RB28′ kitted block, with lubrication taken care of by a Ross dry sump setup. Upstairs is a comprehensively ported head, packing Iconel valves and a pair of Tomei camshafts. 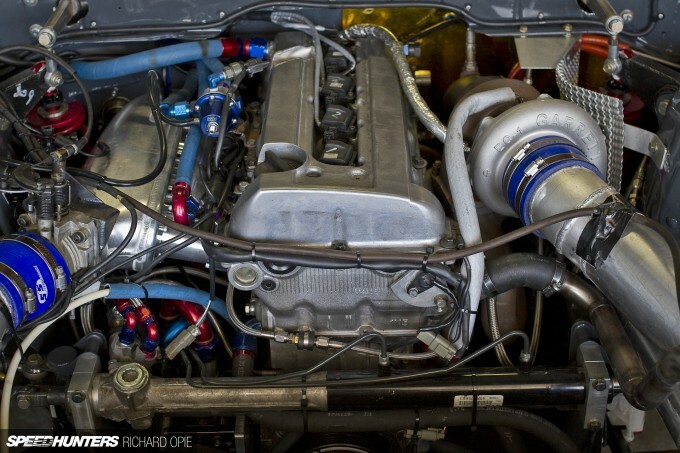 For the GT-R purist, there’s nothing quite like the retention of a twin turbo setup. 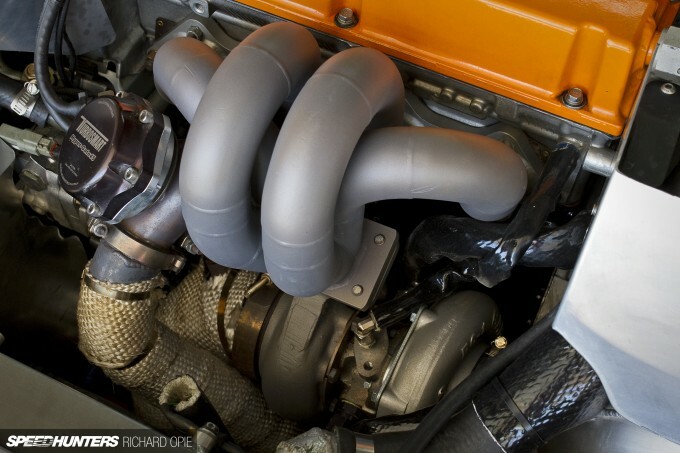 In the case of Matt’s car, there’s a pair of low-mount HKS GT2530 turbines hanging off a port-matched manifold, although by his own admission a big single turbo upgrade is on the cards. 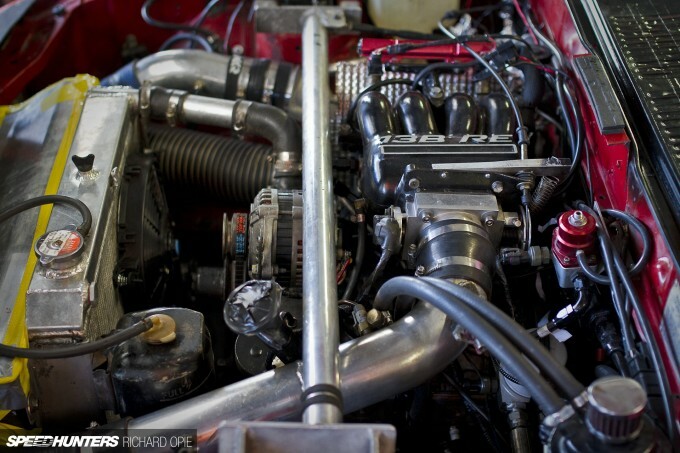 The engine is already well-equipped with big 2000cc injectors and a MoTeC engine management setup. 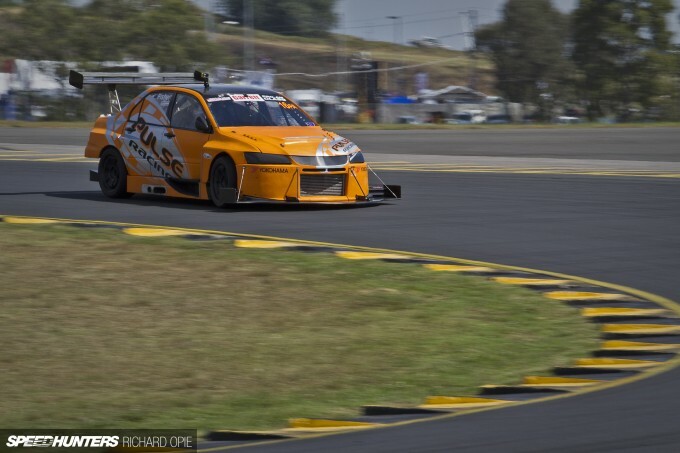 Not all of the WTAC field represent huge power and highly developed builds though. Among the Clubsprint class entrants, more modest machinery can be found, like this Subaru BRZ prepared by Road Track Rally and driven by Darrin Morice. Lurking behind the distinctive BRZ front end, the Subaru retains its FA20 2.0-litre boxer engine with the addition forged rods and pistons to its standard crank in the interests of reliability. The FA20 pumps out a punchy 375hp at the treads, thanks to the addition of a Garrett GTX3076 turbo. Darrin says the car has solid midrange punch right through to redline, all controlled by a Haltech Elite standalone engine management system. 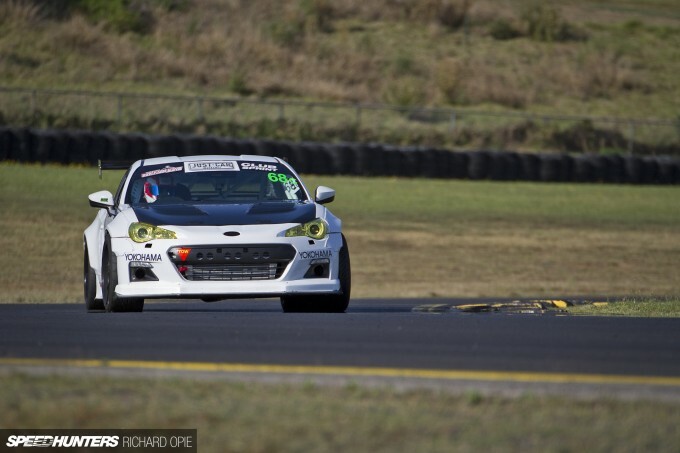 Although a simple setup, the BRZ proved an effective tool for the SMSP circuit posting a 1:47 lap time. 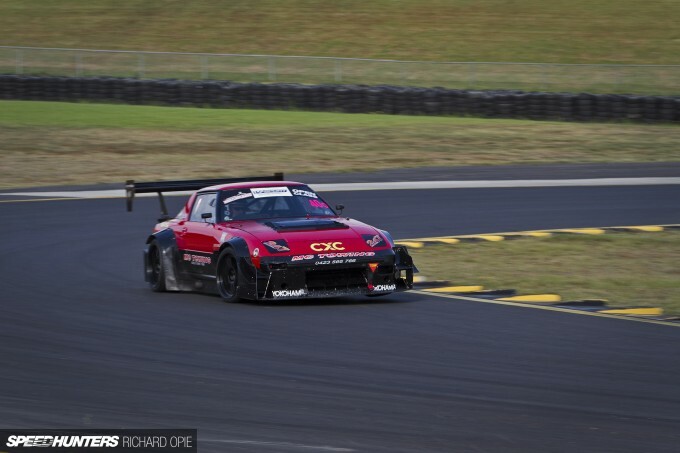 Another WTAC favourite of mine is the Mad Max esque creation of Matty Cole – a fire-breathing and eardrum-destroying Mazda RX7. A rapid drag machine in a past life, this car broke cover at last year’s WTAC event sporting an assortment of aero components in the pursuit of an Open class result. Sitting snugly in the RX-7’s engine bay is a JC Cosmo sourced 13B-REW block, which Matty explains has been treated to small bridge-ports in addition to a small peripheral ports – the rotary equivalent of having your cake and eating it too. Turbo-wise, the 13B receives its compressed inlet air courtesy of a BorgWarner S363 unit, which helps see 605hp to the rear tyres with 28psi of boost dialled in. This power arrives at around 7200rpm – relatively low in the rev range in rotary terms, but for a circuit application right in the thick of things, enabling tractable performance through the curves. What spotlight on engine bays would be complete without at least one LS engine? Particularly prevalent as a cost-effective, high-power swap among the drift brigade, the field at WTAC wasn’t exempt from a couple of LS-powered vehicles of its own. Enter the DS Motorsport Holden Monaro, a clean-sheet build created by owner Lawrence and two good friends (incidentally, huge fans of Speedhunters) over the course of five months leading up to the event. Things don’t get much more Australian than a Holden powered by a grumpy V8, with the Monaro packing a warmed over LS3-based unit beneath the vented bonnet. Now displacing a smidge over 6.8 litres (that’s 416ci in the old money) the LS3 utlises a Lunati stroker crank with associated rods and SRP pistons to achieve a compression ratio of 11.3:1. The net result? A stout 470hp at 7000rpm, with a stump-pulling 930Nm of torque measured at the rear wheels. 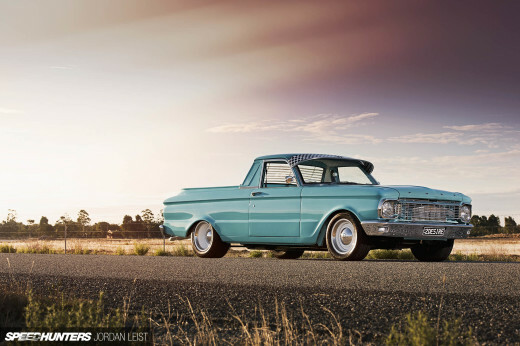 In keeping with the team’s hands-on attitude, the Holden is kept running sweetly with a re-flashed factory Delco ECU – a no less powerful alternative to an expensive standalone unit. 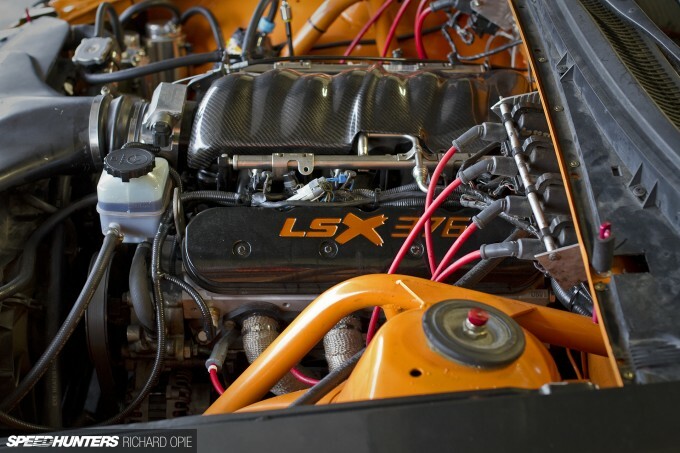 Atop the LS3, the team elected to retain a standard inlet manifold which is fronted by a large 102mm throttle body fed cool air by a DuSpeed over-the-radiator duct arrangement. A car not commonly seen as a platform aimed toward time attack – at least not in this part of the world – is the Toyota MR-S. The last in the line of sports cars that began with the iconic AW11 MR2 in the early ’80s, the series of lightweight mid-engined machines lost its edge with the debut of the ZZW30 chassis. Victorian Justin Gaujenieks arrived at SMSP with his carbon-clad variant in tow, very much in development form but no less eye-catching. Squeezed in the compact engine bay, Justin’s MR-S features a 2ZZ-GE transplant – the engine typically found in the front-wheel drive 7th generation Celica. In this early guise, the 2ZZ long block remains entirely stock, but hanging off a neatly packaged turbo manifold is a large Turbonetics 60-Series turbo. According to Justin, the engine has peaky power delivery, with full boost achieved at just over 5000rpm and maximum output of 295hp closer to the 7000rpm mark. If there was a prize for the least restrictive exhaust, the MR-S would surely be in the running; the external wastegate also venting out the rear panel alongside the tail pipe. Not visible in this image, but slung just below the pipes in a rear bumper cutout, is the air-to-air intercooler. It’s a system Justin openly admits is not perfect, but as this year’s effort was focused on the chassis setup and learning the car, all that the team asked of the engine was reliability. With WTAC 2015 behind them, Justin and the team are eagerly anticipating a more serious, 400hp-plus 2ZZ build. Not all time attack builds stem from a base with sporting intentions. 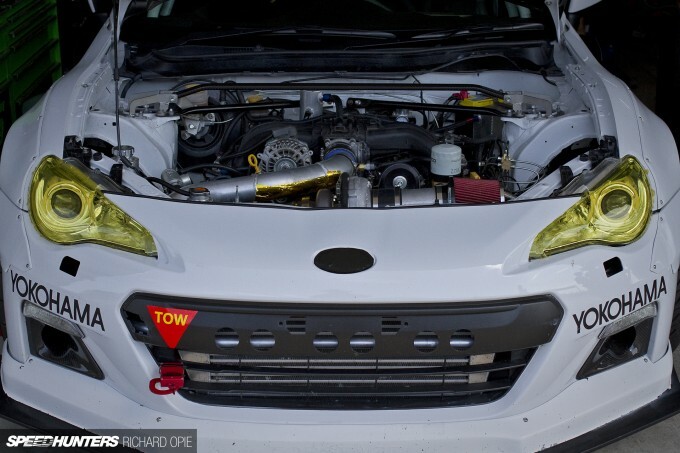 Perhaps one of the most curious builds – and definitely the utilisation of one of the least inspiring starting points – is the Holden Astra (that’s an Opel or a Vauxhall in other parts of the world) campaigned by Insight Motorsports. Mandatory extreme aero meant the only front-wheel drive entry in the Pro class looked a far cry from its pedestrian beginnings. Open the bonnet, however, and things get even more wild. The Insight team elected to install a Honda K24 engine complete with a host of trickery in the name of making numbers. De-stroked with a Brian Crower crank and rod combo, the K24 has been built to spin to in excess of 10,000rpm, although for this event, with the engine being so new and fresh off the dyno at 7:00am on the Friday morning of WTAC, a rev limit of 8500rpm was imposed. 4-Piston provide the CNC-ported cylinder head, complete with 4-Piston cams and valvetrain to suit. Popular among WTAC competitors, Hypertune also provide the inlet and exhaust manifold combo bolted to the head, with a BorgWarner EFR9180 turbo and twin wastegates providing and controlling boost levels. Another WTAC build that’s very much still in a state of early development, the K24 is run by an Emtron ECU – a creation of Insight Motorsport director Scott Kuhner. This means the Astra serves a secondary function as the testbed for the Emtron offering. Despite the bright orange hue, the Pulse Racing Mitsubishi Lancer Evo IX presented a somewhat more restrained approach for a top-level Evo build. I spoke to Paul Fisher, Pulse Racing’s owner and builder of the Evo about what makes it tick (that’s not a Mitsubishi pun either, guys). In a previous life, the Evo’s 4G63 displaced 2.4 litres, however for 2015, the engine has seen a reduction in capacity to 2.2L. This smaller capacity, coupled with the addition of a new sequential dogbox, has allowed the 4G63 to spin more reliably to headier levels – 9500rpm, “all day, every day, at safer piston speeds,” in Paul’s words. More revs mean an improved ability to keep the big turbo spooled, peaking at 8800rpm with 690hp at the Advan semi-slicks. The approach to boost reflects the period of time this car has been competing in this arena. Slung beneath a Hypertune manifold, Paul retains an ‘old faithful’ Garrett T04Z turbine, complete with custom T3-flanged exhaust housing to fine tune the characteristics of the unit. Typically a laggy unit, the aforementioned increase in useable engine speed allows driver Paul McKinnon to keep the turbo in its usable range, meaning there’s life in the old dog yet. A big Turbosmart Hyper-Gate45 keeps boost levels in check. Nev Scott’s GDB chassis Subaru Impreza WRX STI held the somewhat prestigious honour of completing more laps than any other car over the WTAC weekend. Kindly sharing the drive with Scotsman Andy Forrest after his own WRX killed its gearbox in testing, the Open class sedan ran faultlessly throughout, possibly by virtue of its regular use, racing door-to-door in the Sports GT class supporting the V8 Supercar Championship. 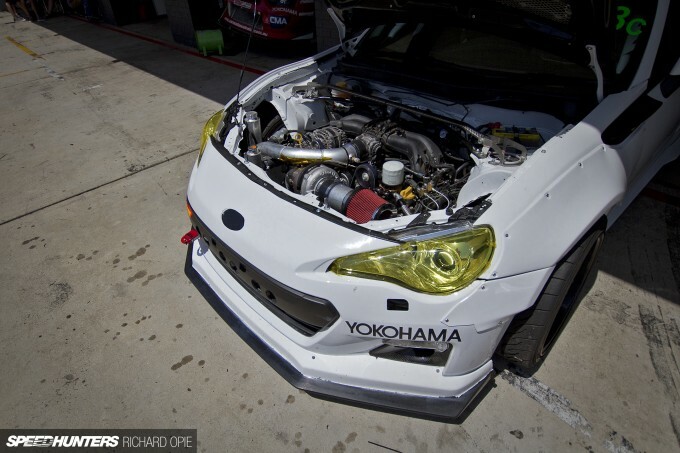 Brisbane-based workshop JHH Performance is responsible for the built EJ25 that gets the Subaru up and moving. Forged pistons and rods, head work and a set of ‘big cams’ provide the basis for a reliable powerplant, given the primary intention to last full-length sprint races in the heat of competition. 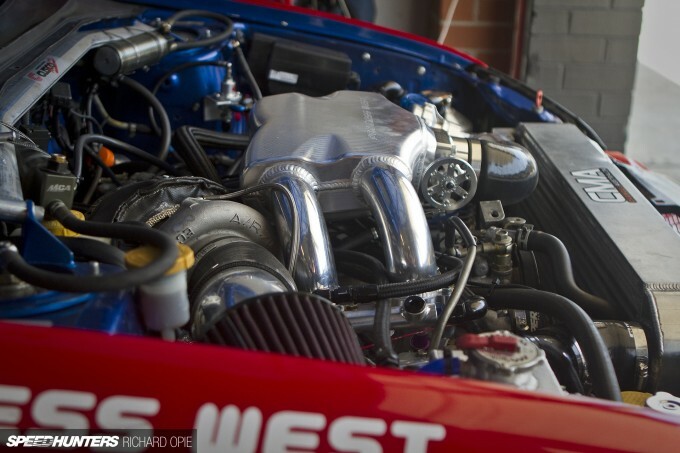 Prior to this year’s WTAC I’d never laid eyes on a Process West inlet plenum – an off-the-shelf component used in the CMA car as well as a selection of other Subaru competitors. Beautifully machined and welded, the plenum relocates the throttle body to the front of the engine, ensuring a cleaner, more direct airflow to the Process West intercooler setup. A Garrett GTX35 turbo is wedged in the space freed up, and with the help of E85 fuel the car achieves a conservative 430hp at all four wheels, all in the name of reliability. 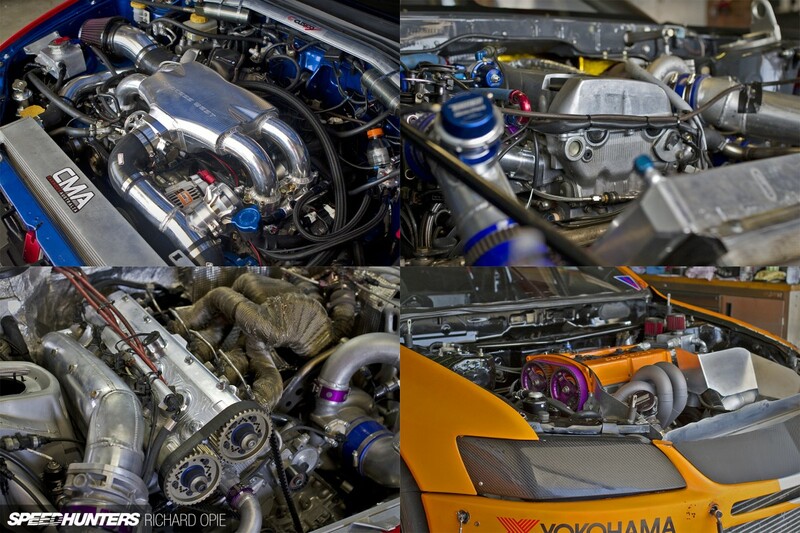 This wraps up my engine spotlight from the Yokohama World Time Attack Challenge – a ‘box of chocolates’ take on the variety of methods involved within the confines of the time attack engine bay. There’s one thing that never ceases to impress me about this event however – passion. Speaking to each of the above teams and more, it’s clear the challenge of time attack appeals on a range of levels, be it outright victory or personal challenge. With these objectives driving development, I can’t wait to poke my nose among the oily bits of 2016’s WTAC competitors! Mentions it in the article. It's a process west unit. Did anyone else notice the Gatorade bottle in the Subaru engine bay? Oh wow, that GTR engine bay. Perfection. That's a Big turbo on that Astra/Honda! The R34 isn't exactly wild, but man that's a nice looking engine bay. Peter_Kelly Just like the Kyushu-Danji car last year, this thing just hits that balance between track and street visuals that for some reason always works for me. 333pg333 If you're going to build something weird, make it go damn fast! BT180 Couldn't agree more - immaculate. Restrained. Functional. SnoozinRichy 333pg333 Oh I know many of these cars quite well. We shared a driver with the Pulse Evo. I correspond with the Owner of the Astra too. Didn't realise he had that turbo on there. Sure, big can be powerful but not necessarily fast. I'll ask him for some logs. 333pg333 SnoozinRichy I'm picking you own the 944 then? I adore that car - hope you're happy with how your weekend went! SnoozinRichy 333pg333 Thanks. I occasionally adore it too! We're happy and frustrated at the same time. A lot of our competitors did some serious testing this year, plus substantial upgrades. We haven't been back to the track since WTAC 2014 and we went from a 3.1ltr to a 2.5ltr motor with less power/tq...so, it was hard to compete knowing we should have been quite a bit faster. We're back at the GP track this Saturday and I'm betting if it doesn't rain we will go faster than 1st place in Open class from a week ago. We were meant to have a 3.2 16v motor in the car by now and that would have got us a long awaited win in Open for sure. The car has a 1:28 in it with more power and testing. As they say..."There's always next year!" Nice to see Astra's at WTAC. We have a good number of them in the UK's MSA Time Attack Championship. Including my own. Would be awesome for you guys to do a piece on the UK TA scene next season. cool to see the MR-S, I have a stock 2zz in mine and it is a bit of a laugh and certainly the car Toyota should have built, but an extra 100bhp (or 200 as they target) would make it a real weapon! Came here to see if anyone was running an LS (I'm a big fan of that package), wasn't disappointed. That said can anyone explain something to me? I heard somewhere that time attackers don't use LS's because the torque characteristics of big V8s make their significantly lightened cars difficult to manage around the track and makes wheelspin quite seriously problematic in chasing a quick lap-time. Can anybody comment on the veracity of this statement? That's awesome that you guys featured a Monaro!! It's got electrolites! It's what (power)plants crave! Carbon plus Toyota's in 100mm meet in Melbourne today ! 333pg333 that's a huge 4 banger! No replacement for displacement. good luck! BT180 It doesn't make sense for flat black to stand out but it's actually beautiful. Saw a 2J 240 with this treatment; looks immaculate and expensive in person. Nice to see LS ignition coils relocated... they have no business being on the valve covers lol. Fun to see all the different approaches to strut tower reinforcement. 10,000 rpm??? roller bearing crank or what!? Time attack is the best kind of insanity. Saved this page for (much) future reference. KenzoPons would love to see that thing spit some flames! Hell yeah looks like it's ready to drop the hammer !! AD88 Yes more TA please! I bet the gobstopper machine will be there? hopefully. We can run the EFR9180 as it runs the twin scroll turbine housing and the Hypertune manifold works very well. Combined this with the Emtron ECU adn Scott KUHNER's tuning at Insight and it lets us get it up on boost early and keep it there. Considering the very high RPM limit (we ran it past 8500rpm on Saturday) we end up with 5000-6000rpm of usable rev range. Not a bad thing. JonathanW Should be a potent little machine next year, Justin and the team are all top guys and I wish them all the best for future hooning! AfroGTO Tricky not to... this is Australia after all! bluestreaksti Stoked you're into it! And yeah - there is so much more to comment about in the engine bays than simply the engines. bluestreaksti 333pg333 There's plenty of luck in Motorsport. Most of it's bad! So thanks. We need tq with this car. Running a stock syncro H pattern box is a real disadvantage so the less gear changing we need to do the better. The 3.1ltr saw a peak of 720Nm at the rear wheels and that was only at 25psi. The next motor will have more I would think...but also be able to rev a bit higher. Well that's the plan...they don't always work out though. Helium3 333pg333 SnoozinRichy Where are you seeing boost? 5-6000rpm range is massive!!! So by 4000rpm we are well and truly up and onto boost (got to love the pairing of teh Honda K-series and a twin scroll EFR) and given the size of the 9180 and a redline at 10,500rpm we have usable range almost right up to it. The 4Piston head is amazing and makes it work. We only ran low boost but we did push to 10,000rpm on Saturday (you can here it when the car comes over Corporate Hill in the video from the Livestream) and the 9180 was still well within its range. Helium3 AD88 To confirm, it sounded and looked freaking brilliant coming down the straight into T1 from the roof!! Helium3 AD88 exactly why I chose it! An Astra with a highly strung Honda engine competing in the top tier?! Who would have thought! Helium3 333pg333 SnoozinRichy All I can say is WoW!!! They're numbers I don't even contemplate. You Sir, have me at a disadvantage!